Anyone tried Travall Dog Guard for the Q5? 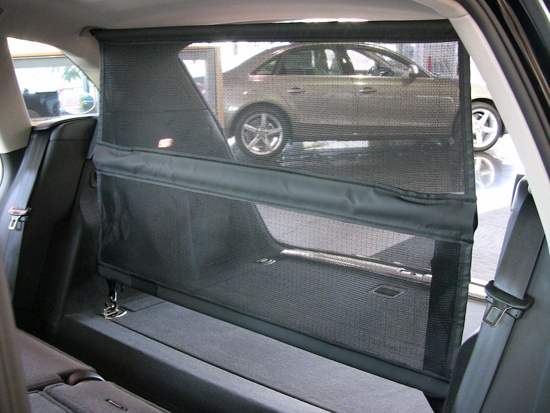 Thread: Anyone tried Travall Dog Guard for the Q5? If anyone uses this product, can you share how well it works, and whether the "feet" cause visible wear to the plastic window sill trim? I dont have one in my SQ5 yet, but I had a Travall in my last SUV and it was great, definetly the best one I have found. I did have to use some loctite as the nuts came out a bit on the rods. But no, it was in the car for 5 years and never caused any damage not even a scratch. Ill be getting a new one for my SQ5 just not got that far yet. I bought and use one. Got it through Amazon. It is really high quality. No issues with the little feet. Thank you all. I found an Audi branded dog barrier on eBay thanks to another forum member. It was relatively inexpensive, so I decided to go with that. Hopefully I won't regret it. Any have a link to that OEM dog barrier? I'm curious what it looks like as I've been thinking about the Travall one as well. Does this barrier basically prevent the dog from slobbering all over my rear head rests? If so...sign me up. LOL. It keeps them in the rear compartment where you would have a plastic liner or whatnot, and they can not get over the seats into the back seat. They are only half height so if you drop the rear seats they and you can still go under the barrier. I loved it in my last car. Thanks! Glad I asked as that thing does not look good nor does it appear formidable enough for my dog. It does however look like it would be easy to take in and out of the vehicle so that's a pro for sure. Yes, that's the one I ordered. Thanks for pointing out the eBay ad. I wouldn't have been willing to pay Audi's $585 retail price for this, but for under $100 shipped for a supposedly new one, it seemed worth it. Installation takes two seconds. There are existing holes in the headliner that it slides into. Then latch the bottom. If I understand correctly, those would be the keyhole shaped holes behind each row of seats. Does that mean the barrier can be used in either location? It's on its way from Germany, so I don't have it yet, but I can't see where I would secure the bottom to behind the front seats. but I can't see where I would secure the bottom to behind the front seats. Looks like it goes to the D rings on the floor. They are shiny and chrome plated, you can't miss them. I understand about the tie down rings in the cargo area, but was hoping to also be able to use this between first and second rows, since there seem to be corresponding mounting points in the roof behind the first row (driver and passenger) seats. Maybe there will be something I can connect the bottom straps to under the seats. It wouldn't need to look pretty, and it would only be for occasional use.